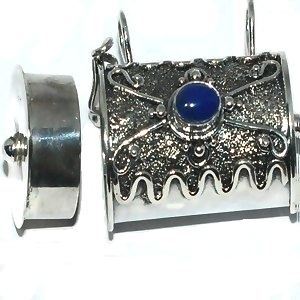 Sterling Silver 925 Hand Made Cylinder Prayer Box Pendants. A functional lid can be used to open and close the cylinder to put your keepsakes. The pendant has a latch to keep the lid shut. These Prayer Boxes are also known as Poison Boxes and Keepsake Lockets.